Daydream or ‘live the dream’? I dream about France a lot — usually Paris. Sometimes I get confused about what I’ve dreamed and what I’ve lived it’s present so much in my subconscious. We thought we may move there once a few years ago. It’s a long story that ended with my mom relieved and Brian and me bitterly disappointed. I still think a lot about moving there, we both do. I have terribly unbecoming pangs of envy when I hear about Americans who are living there, especially those writing for a living, and *especially* those writing about food for a living. So what’s to keep us from doing it? (Aside from all the things that actually are keeping us from doing it, that is?) We don’t have kids, not that that need stop anyone, but it’s certainly less to uproot should we decide to move across an ocean. Neither of our families live in the same city, so we see them only a few times a year as it is. I have a little bit of French — a pitiful amount really when you think of the years I spent studying and conjugating, but I could get us by until we learned more. So why not seriously just do it? We may yet, but I wonder about the difference in dreaming it and living it. I know the difference in dreaming of travel to a place and the reality of being there. Alain de Botton explains it beautifully in The Art of Travel — part of it is that we are still who we are, no matter our locale. Our petty worries and little unhappinesses travel right there within us. My real fear is that the living will destroy the dream of living there. My dreams mix up the best of rural, Provencal France with the best of Parisian life. And obviously in both dreams money is not a concern. In real life, we’d have to pick one or the other and would be worried always about having enough euros. In daydreams I’d eat baguettes and oozy cheese every day, shop at the markets with a little basket and cook fabulous meals with amazing ingredients. In real life we’d likely be in an apartment half the size of our current house where we already get on each other’s nerves trying to work together in the kitchen. 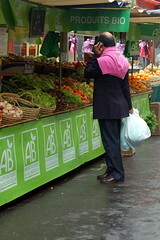 We could be pressed for time and have to go the a supermarche instead of the street markets. My French would not be sufficient for more than ‘one of this’ or ‘one of that’ making meal shopping a trying and frustrating experience. I’d get huffy about the subway being crowded, and be dismayed when the weather was grey. It makes me sad to think of losing the daydream of living in France to the bureaucracy and boring details found in the reality of day to day life in a foreign culture. But not so much so that I’ll stop daydreaming that someday, we will just do it. 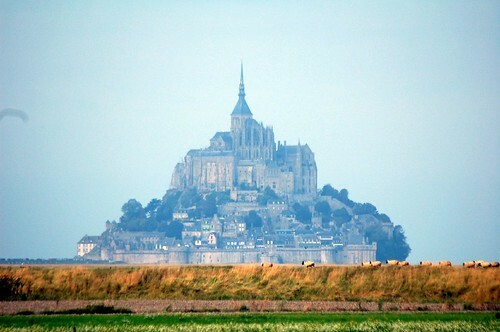 This is a great post, beautifully illustrated by your dreamlike image of Mont Saint-Michel! 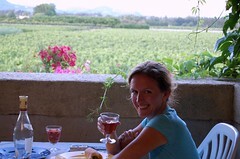 AS you know, we took the plunge when we moved to Italy 6 years ago. It was never our dream to live in Italy, but when it just happened, we both embraced the opportunity and have never regretted it! Yes, the bureaucracy can be puzzling AND maddening, and yes, there are certainly things, and people, and food that we miss from the states, but those things are remedied with a flight back to the states every so often. I know what you mean about wanting to live in Paris, we want to badly and have wondered the same things as you whether the realities of it would crush the dream. I don’t think so, but then of course you will never know unless you do it! We are selling our house next year bad market or not and going for at least a year…its just got to be done! I’ve read Alain de Botton’s book as well – he says some valuable things which ring very true. One recollection I’ve got was driving home to Yorkshire from my work location at that time (Edinburgh in Scotland) on a Friday evening at the start of a national holiday weekend. I was near the end of the journey, heading south on the M1 (a major motorway in the UK), in convoy with an enormous number of cars pulling caravans (weekend mobile homes) also heading south. What struck me was that there were as many caravans on the other side of the road, all heading north! What was in the south that the northerners wanted to see that the southerners were so ready to leave behind? – and vice-versa, of course. The answer is that each group simply wanted to see something new, unfamiliar: they could no longer look at their usual surroundings with fresh eyes. There are a lot of Brits living in France these days, and they have interesting things to say. Forget Peter Mayles! – all these ex-pats say that after a while the excitement of being in France fades away, it becomes just ‘where they live’, only with added bureaucracy, and many of them get quite frustrated and depressed. Some of them then come back to the UK; others persist and perhaps get through the bad patch. It’s an interesting fact that the Brits who do best when going to live abroad are those to take a bit of Britain with them – the ones who live in the ex-pat communities of Spain or Cyprus. They’re almost entirely english-speaking, UK food is sold in the stores, UK tv channels are available, it’s just like the UK but with added sunshine. And many, many people are very happy there. Many people take the plunge and move here to Cyprus to live the dream. Most find it was not what they expected, but manage to turn things around and make a new dream happen. Others however don’t quite get it, and eventually move back someone disillusioned. I say do it, and make of it what you can, you only live once.